Vaccines designed to protect people from the influenza virus tend to concentrate on hemagglutinin, one of the two prominently displayed proteins on the surface of the virus and the primary target for influenza prevention. In the April 5, 2018, issue of the journal Cell, however, teams led by Patrick Wilson at the University of Chicago Medicine and Florian Krammer at the Icahn School of Medicine at Mt. Sinai Hospital in New York City argue that placing greater emphasis on the comparatively neglected protein, neuraminidase, could substantially decrease infection rates and reduce disease severity for those infected with the virus. These two viral-surface glycoproteins have distinct roles. Hemagglutinin enables the virus to attach to a host's cell membranes and enter that person's cells. Once inside the cell, the virus makes multiple copies of itself. These copies then prepare to burst out of their hijacked cell and infect more cells. The virus cannot get out of the cell, however, without help from the other protein. Neuraminidase facilitates egress. It enables newly formed viral particles to escape the original cell and infect nearby cells, where they multiply again, repeating the process and allowing the infection to spread rapidly throughout the body. "Hemagglutinin activity has been the primary measure of influenza-vaccine efficacy for decades," said Wilson, the study's senior author and a professor of medicine at the University of Chicago. The current anti-flu vaccines concentrate on hemagglutinin. "But they do a poor job of stimulating the immune system to neutralize neuraminidase," Wilson said. "Neuraminidase, one of two prime targets, has been profoundly neglected. This leaves a big hole in immunity." Interim estimates from the Centers for Disease Control and Prevention confirm the need for a more trustworthy vaccine. The U.S. Influenza Vaccine Effectiveness survey found that the vaccine's ability to protect people from influenza A or B during the period from November 2, 2017, to February 3, 2018, was a dismal 36 percent. That fell to 25 percent for the influenza A (H3N2) virus. In the previous three influenza seasons, effectiveness ranged from a low of 19 percent to a high of 48 percent. So Wilson and colleagues focused instead on the neglected link. Neuraminidase is "highly immunogenic," he said. Infection induces nearly equal numbers of neuraminidase and hemagglutinin-reactive B cells. These cells produce the crucial antibodies that block activity of flu-related viral proteins. But the current vaccines rarely trigger an effective response from neuraminidase-reactive B cells. "The hemagglutinin tends to maintain its structure," Wilson said, "but the neuraminidase, a more complicated, delicate four-part structure, breaks down. It sort of falls apart." As a result, the antibodies that should neutralize neuraminidase, locking potentially virulent viral particles inside infected cells, are much less effective. In many cases, the neuraminidase component of the vaccines triggers antibody production at levels "nearly 90-fold lower," the authors note, than antibodies aimed at hemagglutinin. "The current vaccines rely on sub-units, small pieces of the neuraminidase protein, rather than the full target," Wilson said. "The current process of inactivating the vaccine seems to destroy the neuraminidase protein." When the researchers tested monoclonal antibodies collected from unvaccinated mice that were infected with influenza, they found that those antibodies could provide robust protection. Even when given to mice 48 hours after infection with the virus, the neuraminidase-reactive antibodies were effective at levels comparable to the hemagglutinin-reactive antibodies, protecting the mice from a lethal influenza challenge. "Our results demonstrate that hemagglutinin should no longer be the de-facto target in influenza vaccine development efforts," Wilson said. "We think including an improved neuraminidase component to future influenza vaccine compositions can reduce the severity of illness and decrease the frequency of community-acquired influenza infections." "With a robust response to neuraminidase," the authors conclude, "the degree of protection conferred might protect from any influenza infection." It could even provide "broad-ranging protection," they suggest, "against potential pandemic strains that express N1 or N2 neuraminidases." 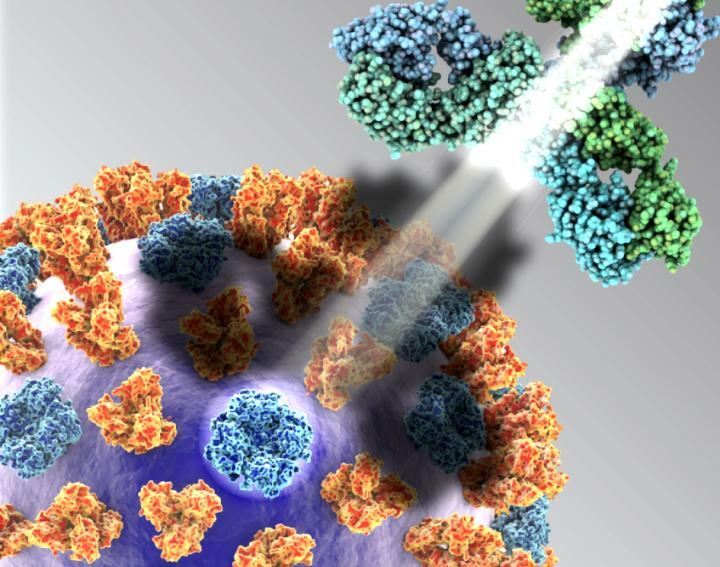 The study, "Influenza infection in humans induces broadly cross-reactive and protective neuraminidase-reactive antibodies," was supported by the National Institute of Allergy and Infectious Diseases and the Food and Drug Administration.